As the China-Pakistan Economic Corridor (CPEC) develops rapidly, investors have turned their attention to Pakistan's Gwadar port city. Gwadar, one of the Belt and Road Initiative's most crucial corridor junctions, has been speculated to rival the miracle of Dubai, one analyst says. Sputnik discussed the future of the CPEC corridor with Zeeshaan Shah, China-Pakistan Investment Company (CPIC) board member and founder and CEO of ONE Investments, one of London's leading property investment companies. Sputnik: Can you tell us a little bit about your company and role? Zeeshaan Shah: CPIC are a privately-held real estate investment company focused on opportunities within the China-Pakistan Economic Corridor, and are owned by a number of high net-worth shareholders in Pakistan and abroad. I am one of [the company's] board members here. Sputnik: Can you give us a brief assessment of the Pakistani economy and labour force? What are some of the most promising sectors to date? Zeeshaan Shah: Pakistan is an underrated economy with an abundance of opportunities. If you look at the economic indicators of growth over last 12 months, Pakistan's been amongst the highest-performing in Asia. Conversely, our next door neighbor India is a much larger country and economy with great PR from the world's largest conglomerates and multinational firms in the financial, food and beverage, or FMCG sectors, whom have entered its markets in a big way. Contrarily, you haven't seen those companies enter Pakistan in such volumes. On one hand, you've got a big one, India, with great PR and a well-established democratic system and a smaller one, Pakistan, with negative PR and other problems. For that reason, people choose to go to India and ignore Pakistan, but for more shrewd and forward-thinking businesses, [Pakistan's] a green field opportunity. You look at all the big organizations in the FMGC like Procter and Gamble, Pfizer, and they indicate that product consumption is very high in Pakistan. In terms of consumer spending, they're amongst the highest in Asia; much higher than India or even China. Their middle class is also estimated to be around 50 million with huge amounts of urbanization and growing cities. They used to have three major cities and now they have ten, so urbanization and growth are happening at a very fast pace. It's the sixth largest country in the world in terms of population, including the youngest in the world, so this is where the future is. You can ignore Pakistan today, but in the next five to ten years, Pakistan's not going to be an option, but a necessity. Sputnik: Why exactly has your company chosen Pakistan's Independence Day to inaugurate this Downtown Gwadar project? Zeeshaan Shah: Downtown Gwadar is within our master community project, the China-Pak Golf Estates, which are a 4.8 million square foot gated community with 1,800 homes near commercial centres, schools, hospitals, a feature six-hole golf course and all the amenities you would expect from a world-class community. Downtown Gwadar is one of the phases within China-Pak Golf Estates and we launched our project August 14 because of the significance of Pakistan's Independence Day. This is one of the most prime developments in Gwadar, located on the main CPEC highway which connects Gwadar with the rest of the country. The downtown segment is also located on that highway. Sputnik: On the London side, how can investing in the Belt and Road Initiative (BRI) help the United Kingdom in the post-Brexit era? Do you see Brexit as an opportunity to work in tandem with emerging markets? Zeeshaan Shah: Commonwealth countries form a significant amount of the world's emerging markets today. With Brexit and us distancing ourselves from Europe, I think it's a great opportunity to The United Kingdom to form closer personal and economic ties to the Commonwealth and rekindle those relationships. When you look at Pakistan, India and many other Commonwealth countries, they've got a deep-rooted history with the British. Pakistan has a legal system based on the British, and in the UK, we've got the largest expat Pakistani population in the world, second only to the Middle East. There's a great connection and great opportunity to capitalize on those links further. Sputnik: Why is your company investing in the CPEC? What are the benefits of doing business in Gwadar? Zeeshaan Shah: Gwadar Port is a gateway city to the China-Pakistan Economic Corridor (CPEC) and is being connected by a rail and road to Kashgar, a city in China's western Xinjiang province. This will reduce shipping times up to 85 percent for China as it trades with the Middle East. China has leased it to the Pakistani government for a period of 42 years as a free zone, meaning that you can operate there on a tax-free basis. It was inaugurated on January 1 of this year and over 30 companies are investing in the free zone from the financial, fisheries, and vehicle manufacturing sectors. Private companies have committed over $500 million dollars and the Chinese government are investing $4.8 billion, including a new international airport, a 300-megawatt power plant, and port upgrades. The second phase of the Free Zone has been upgraded. 300 miles away, you've got Dubai where over 20 percent of the GDP comes from the Jebel Ali Free Zone, and with Gwadar not having its own free zone and a superior location, in the next 10 years, it's quite possible to have Gwadar to become another Dubai. Considering Dubai, if governments were merely investing in infrastructure, it would only get but so far. There's a role for private organizations in developing cities, countries, and economies. Building the social infrastructure is a key component in growing Gwadar and that's what we're doing at CPIC. If you look at top professionals living in Lahore, Islamabad, Karachi Hong Kong, Beijing etc., and they're offered job opportunities with higher pay and tax-free income, but if the communities and social infrastructures not there, then that growth gets stunted. That's the piece of the puzzle that we're bringing together-developing the social infrastructure Gwadar needs to thrive. The Chinese predict that by 2023, Gwadar will become the biggest shipping port in South Asia. We're instrumental in all of this and a part of something big in the years to come. 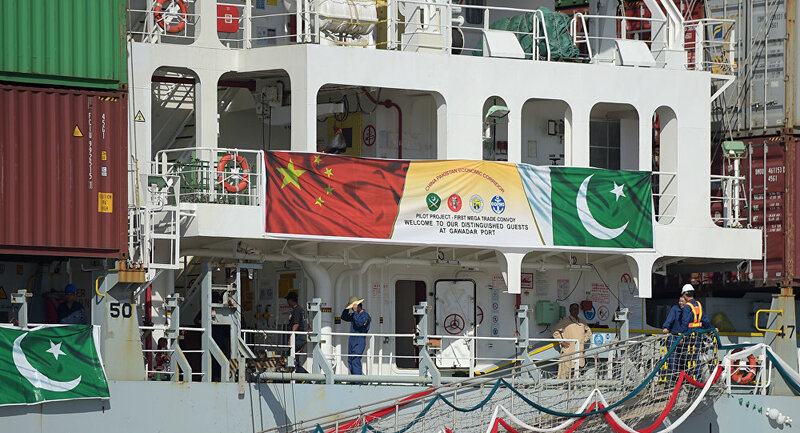 What's CPEC, and How Does the Future of the Multipolar World Depend on It?